On the 4th day our journey with the Celts to the Crèche, we meet St. Columba, (Colum Cille meaning “dove of the church”) who was an Irish monk, abbot, scholar, and missionary who spread the gospel of Jesus Christ in Scotland, England, and throughout western Europe from the monastery he established on the little island of Iona off the western coast of Scotland. You may desire to continue reading more about Columba or go on to the Meditation towards the end of this page. Early Life: Columba grew up in Garten in County Donegal in Ulster. He was a descendant of one of the most powerful royal dynasties of Ireland, the Ui Neill clan of northern Ireland that descended from the famous Niall of the Nine Hostages. His mother was descended from a king of Leinster. He studied under the famous monastic teachers, Finnian of Moville and Finnian of Clonard. 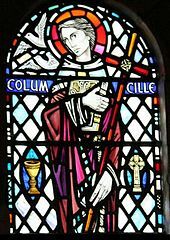 Columba was ordained as a deacon at Moville Abbey and was ordained as a priest when he was about thirty years old. While in Ireland, Columba established several churches and probably at least twenty monasteries including Derry on the banks of Lough Foyle and Durrow in County Offaly. Some believe that he also established the Abbey of Kells in County Meath on a former Irish hill fort. There are heritage trails of St. Columba’s journeys and monasteries that he established. St. Columba Heritage Trail map in Derry, Ireland of places that Columba established before going to Iona. Ancient church built in the area where Columba was born in Garten, Ireland. A monastery likely was in this place also. 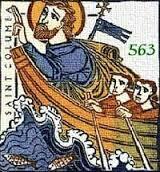 Columba had already established several monasteries in Ireland, but in 563, he sailed with 12 companions to Iona in Scotland, with no oars trusting the Spirit to take him to wherever the Lord wanted him to serve. That little boat landed on the Isle of Iona on the day of Pentecost, where Columba began creating one of the greatest centers of faith and evangelism in Christian history. It is said that he chose Iona, near the Isle of Mull in the Inner Hebrides off the west coast of Scotland because when he stood on the highest hill on Iona, he could not see Ireland from that place. 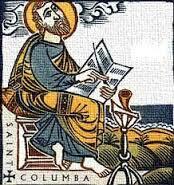 Columba’s Life Work: Columba was a scholar, poet, evangelist, and visionary. It is thought that Columba was an important leader in evangelizing the Picts in Scotland. There are eve three surviving early medieval poems which may be attributed to him. He spent much of the last years of his life copying manuscripts by hand in the scriptorium at Iona. It has been said that he personally copied 300 manuscripts. This influence passed on down through the years on Iona, as some Anglo-Saxon manuscript scholars believe that the magnificent Book of Kells was handwritten and gorgeously illuminated about 800AD at the scriptorium at Iona. In July of 2017, it was announced that archaeologists had completed radiocarbon testing on wood fragments that had been retrieved by archaeologists in 1957 from what was thought was Columba’s cell on Tòrr an Aba (Mound of the Abbot). The radiocarbon tests came back with the era of Columba, 540-650 AD. This is a very exciting discovery for those who love Iona and Columba. Columba’s Place of Resurrection: Columba lived on Iona for 36 years and died on June 9, 598 while copying Psalm 44. A favorite story relates that the aged Columba was out walking one afternoon and he grew weary. 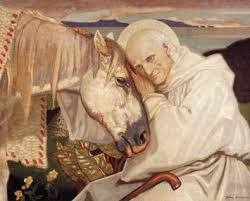 As he sat down by the roadside to rest, his white horse who carried milk for the monastery came to him and laid his head upon the saint’s breast and tears flowed from the horse’s eyes as he gave farewell to the master he knew was dying. Columba was buried on Iona and later his relics were divided and some came to rest in the same coffin with St. Patrick and St. Bridget at Downpatrick in Ireland. Iona’s Influence: Columba’s establishment of the abbey on Iona off the western coast of Scotland in the Inner Hebrides became the “Cradle of Western European Christianity.” This scholarly, yet deeply spiritual abbey sent out hundreds of monk evangelists who shared the gospel and set up monasteries all over England and western Europe. Today, pilgrims come from all over the world to this “Thin Place,” where the veil between earth and heaven seems gossamer, very thin. The Iona Community, an ecumenical inclusive community based on peace and justice founded by Rev. George McLeod in the late 1930’s continues to draw people of all ages and from all over the world to stay, work, and worship on Iona. Harvest Sunday, Sept. 2014 in Iona Abbey. Residents gathered fruits and vegetables along with flowers from their gardens to bring for this special day to honor God as Creator. Bishop’s House. Iona. Stayed here for almost 2 weeks, Sept. 2009. My room faced the water. I was blessed to stay on Iona at the Bishop’s House for almost two weeks in September 2009 to take a course on St. Columba. This was offered through the University of Wales, Lampeter taught by Celtic scholar, Dr. Jonathan Wooding and Iona expert Mairi MacArthur, who grew up on Iona across from the Abbey. It was a dream come true to be on this sacred island and to worship in the ancient abbey, to walk on the same places the great saints have trod, to sit on the isolated beaches and listen to the waves crash, to peruse the incredible museum, and to contemplate at the foot of the huge Celtic crosses throughout Iona. It was quite a pilgrimage to get here by myself the first time and with my husband on the second trip to Iona in October of 2014…plane, tube, train, bus, and ferry, but it was worth it beyond my dreams or imaginations. A few years later, it was a joy to share this historical and sacred place with my spouse. Yes, Iona is a magical, mystical place, where the veil between the heaven and earth is indeed gossamer. St. Columba’s life is a wonderful example that even when we mess up big time in life, that the Spirit of our living God can remold us and remake us. We can find our place of resurrection, not only on the other side of the veil, but also in the here and now. Let us join St. Columba on the pilgrimage with the Celts to the Creche, where the possibility of fresh new starts awaits. Prayer: As Columba evangelized the Celtic people by describing Jesus Christ as his Druid, we too are able to pray, “Christ my Druid, I open my heart to you”. As I journey to the manger in Bethlehem, may You be born again anew in my life. Shine your healing light upon those broken, messed up places in my life. Re-mold and remake me. Thank you for second chances. May the dove of peace fill my life. Hymn: Change my heart, O God, make it ever true. You are the potter, I am the clay. Mold me and make me, this is what I pray. Adomnan of Iona. Life of St. Columba, trans. by Richard Sharpe. London: Penguin Books, 1995. BBC. Digging for Britain. Youtube. Iona. (Iona is the 3rd story, begins at 11:40). Series 6, Episode 3 of 4. Professor Alice Roberts, 18 May 2018. Bede, The Venerable. Ecclesiastical History of the English People, Book III, chapter 4. Brown, Michelle P. How Christianity Came to Britain and Ireland. Oxford, UK: Lion Hudson, 2006. “Columba” and “Iona” by Richard Sharpe in Lapidge, Blair, Keynes, and Scragg. The Blackwell Encyclopaedia of Anglo-Saxon England. Oxford:Blackwell, 1999. Dales, Douglas. Light to the Isles: Mission and Theology in Celtic and Anglo-Saxon Britain. Cambridge, James Clarke & Co., 1997. Dillon, Miles and Nora Chadwick. The Celtic Realms. Edison, NJ: Castle Books, 2006. Earle, Mary C. and Sylvia Maddox. Holy Companions: Spiritual Practices from the Celtic Saints. Harrisburg, PA: Morehouse Publishing, 2004. Herbert, Maire. ‘Columba (c.521–597)’ in Oxford Dictionary of National Biography, Oxford University Press, 2004. “How We Found St. Columba’s Famous Writing Hut, Stashed in a Cornish Garage.“ The Conversation. July 10, 2017. Jones, Kathleen. Who are the Celtic Saints? Norwich, UK: Canterbury Press, 2002. Kearney, Martha. BBC. The Book of Kells: Medieval Europe’s Greatest Treasure?. April 25, 2106. Keys, David. “Archaeological Test Lends Credibility to Find of St. Columba’s Cell on Iona. Church Times, July 14, 2017. Lehane, Brendan. Early Celtic Christianity. London: Bloomsbury Academic, 2005. MacArthur, E. Mairi. 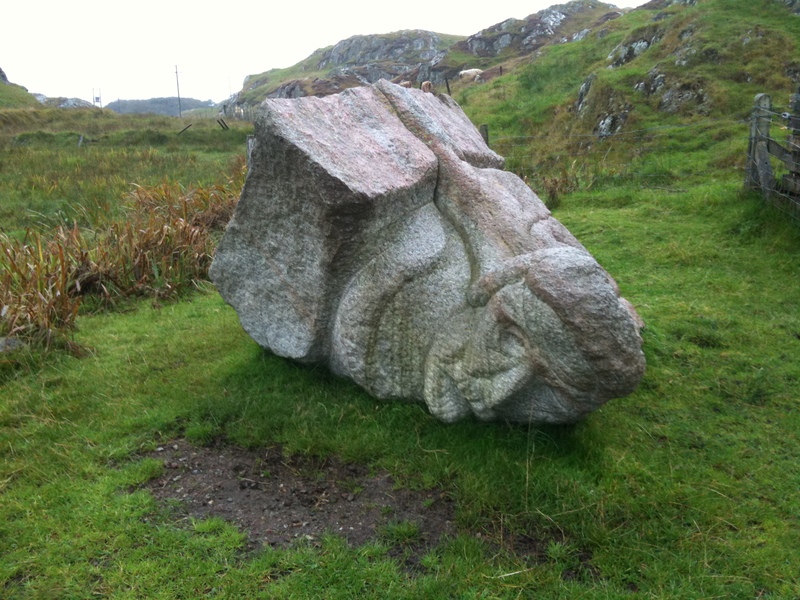 Columba’s Island: Iona from Past to Present. Edinburgh: Edinburgh University Press, 2007 with revisions. Macdonald, Ken. “Scientists Uncover St. Columba’s Cell on Iona. “ BBC News, July 11, 2017. Millar, Peter W. Iona: A Pilgrim’s Guide. Norwich: Canterbury Press, 2007. Ó’Ríordáin, John J. Early Irish Saints. Dublin: The Columba Press, 2004. Pennick, Nigel. The Celtic Saints. New York: Sterling Publishing Co., 1997. Rees, Elizabeth. An Essential Guide to Celtic Sites and Their Saints. London: Burns & Oates, 2003. ___________. Celtic Saints in Their Landscape. Stroud, UK: Amberley Publishing, 2011. ___________.Celtic Saints: Passionate Wanderers. New York: Thames and Hudson, 2000. Ritchie, Anna and Ian Fisher. Iona Abbey and Nunnery, rev. ed. Historic Scotland, 2004. Richter, Michael. Medieval Ireland: The Enduring Tradition, rev. ed. Dublin: Gill & Macmillan, 2005. Sawyers, June Skinner. Praying with Celtic Saints, Prophets, Martyrs, and Poets. Franklin, WI: Sheed & Ward, 2001. Sellner, Edward C. Wisdom of the Celtic Saints, rev. and expanded. St. Paul, MN: Bog Walk Press, 2006. St. Columba Heritage Trail (mostly Derry area). St. Columba Trail (Ireland and Scotland). University of Wales, Lampeter. 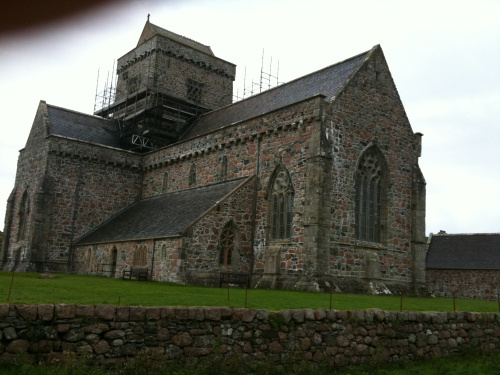 The Monastic Island of Iona: A Study in Place, Time and Thought. by Rev. Rodney Aist with Dr. Jonathan Wooding. 2009. Wallace, Martin. Celtic Saints. San Francisco, CA: Chronicle Books, 1995. “Wooden Hut Associated with St. Columba Dates to His Lifetime, Archaeologists Discover.” Telegraph News, July 11, 2017. This entry was posted in Uncategorized and tagged 40 day Celtic Advent devotional, Adomnan of Iona, Bishop's House, Celtic Christianity, Celtic Saints, Celts to the Creche, Columba, Hereswith, Iona, Iona Abbey, Iona Community, Irish Saints, jonathan wooding, Mairi MacArthur, Online Advent Devotional, St. Columba. Bookmark the permalink.